If you have an outdated ear horn of a hearing aid, it’s time to upgrade it. The question is, should I do it today, or should I wait? You bought your hearing aids ten years ago, and they still seem to work, right? Do you assume that your old hearing aids are fine? Ask yourself “what is the actual cost”? We have made countless huge advancements in hearing aid technology in past few years. 10 years ago many advanced functions weren’t even in design phases. Since then we’ve changed from analog to digital, for starters. 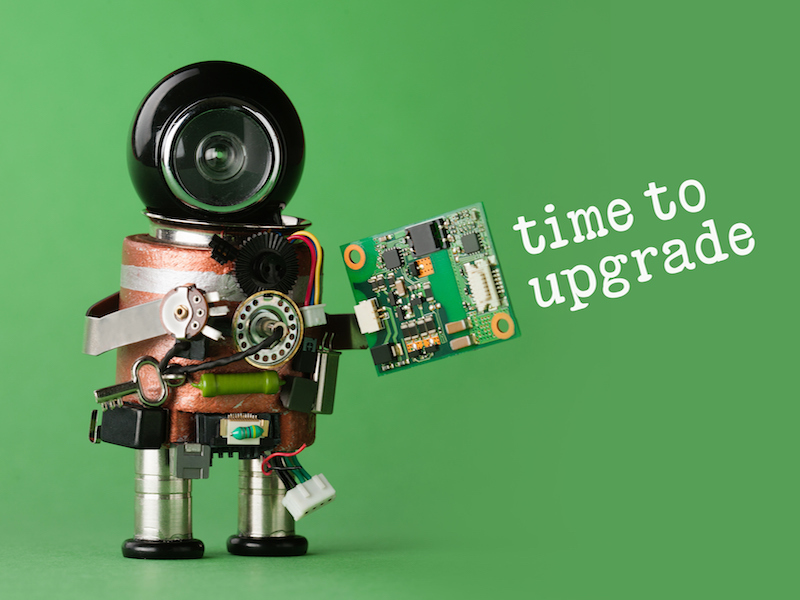 It’s definitely time to consider an upgrade. Give some thought to several reasons why. Older outdated or even cheap hearing aids come with many problems such as that irritating buzzing you hear every now and then. It’s not much fun when you go close to a phone and your out of date hearing aids start to feedback. Then for no apparent reason at all, it begins to make noises. “What now”? Even Though You’ve Become Complacent About it Quitting, That Doesn’t Mean it’s Not an Issue. You’ve become accustomed to lingering off to the side in silent thought while everyone else is engaging in the conversation. How sad was the time your grandson sang you a song he learned but you could only hear bits and pieces? But you still clapped. Older hearing aids have all of these failings. With the last generation technology, we simply turned up the volume. Current technology filters out irritating loud background noise like a buzzing fan. It was not really that loud. One concern when you’re thinking of buying new hearing aids is definitely the cost. When you carefully consider all the factors, you will realize that out of date hearing aids will end up costing more than new ones. Older devices are analog and that means that it’s time to replace batteries constantly. If you are replacing the battery daily, or even more frequently than that, the cost adds up. Let’s not forget the repair costs with outdated technology. You can compare it to an old car. It’s in the shop more often than it is in your ear and repair services are not cheap. It’s Tough to Manage in Life if You Can’t Communicate. Studies show that hearing loss could mean a smaller salary. What person wouldn’t want an asset to their career? Better hearing aids are that asset. When working, it is important to hear your bosses directions or maybe a customer’s request. You will follow directions without wondering whether you got it right and will take part in important discussions without having to worry about whether your hearing aids will hold up or not. Of course, better communication means a higher quality of life, also. You don’t have to sit alone like a wallflower during conversations anymore. Go ahead and socialize liberally now that you can hear. How do you really feel when you see yourself in the mirror with those outdated hearing aids on? Awkward? Noticeable? Seriously?? One of the most significant advantages that come with replacing old hearing aids is style and flexibility. There is an endless range of personalizations available with modern hearing aids including size, color, and shape. It’s possible to have one concealed so tightly into your ear, that no one will ever notice it, or you could make a fashion statement by getting a visible hearing aid in your favorite color. Your ability to hear has changed. You don’t hear as well as you used to even with the hearing aid in . Your life has changed, and your hearing aid has a tough time keeping up. It’s annoying to remove it just so you can talk on the phone, or maybe you’ve changed jobs and now you have to deal with more background noise. Your hearing aid won’t stop cutting out. It just isn’t reliable now, and that’s a problem. You know for sure that your hearing aid is analog. Ouch, time to go digital. Your hearing aid feels heavy. Clunky, old technology is heavier. When you look in the mirror, your hearing aid is all you can see. That old technology takes up a lot of space, too. You are replacing the batteries every day. Modern hearing aids are much more energy efficient and have rechargeable batteries. It’s not brain surgery. If you’ve had your hearing aids for more than seven years, it’s time to upgrade and hear better. Contact a hearing aid professional to get started.